Fast-forward two years, and Alicia is already earning a reputation quite her own in this fringe sport. 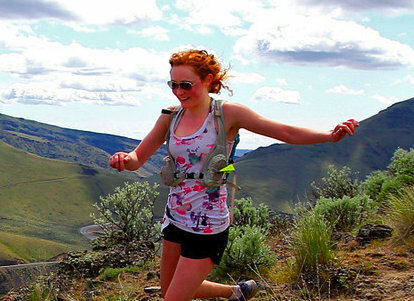 As “the gold shorts girl”, Alicia and her trademark gold shorts have adventured to run Rims in the Grand Canyon, explored through vast sand dunes and open steppe in Mongolia, and even led her to set a few course records in ultras all over Washington, by keeping a sense of fun at the forefront. Alicia has come to represent the fun, irreverent approach to big feats, inspiring those around her to remember the ultimate reasons why they seek physical challenges. When she’s not running through mountains in gold shorts, Alicia invents new products on the Whitespace™ Innovation team at lululemon athletica, guides drop-in snowshoe runs at Grouse, and lives it up on the North Shore of Vancouver.